Looking for a simple and free method to sync Google Gmail contacts on your Apple iPad device. You can easily do this by connecting iPad to a computer and using iTunes. After the connection, select Google contacts option and login to your Google / Gmail account to start the sync process. Here is detailed procedure. Hi thank you for the useful article. I have my Gmail contacts synced to my iPad now. I am also trying to sync my iPhone contacts (which are not on my Gmail account) to my iPad. How is this possible? Hi Dora, to transfer contacts from your iPhone to your iPad, use the iCloud, or if that is not possible, use CopyTrans Contacts, which will manually transfer your iPhone contacts to your iPad via your computer (no internet connection required). Thank you so much for this, I used the program you suggested and was able to do the transfer! Worked great but now I have 2-4 of the same contacts when I try to message or email. But I appreciate that they are there – thanks. If you have any tips for consolidating that would be great! Best method by far!!! iTunes and Microsoft Exchange definitely more challenging and does not bring all contacts in. Thanks! First time I ever could understand anything. It took this old lady a few minutes, but when I found the “info tab” at the top, it was easy then. Hi, I’ve tried to sync my gmail contacts to my iPad following the instructions on the how to. The sync process is over, but my iPad contacts still have no contacts. Does someone know that is going on? I’ve turned off iCloud and tried again, but nothing….. I have been fighting with this for a couple days. I have had no problems for several years with my contacts. It turns out that Google now has your contacts split into “My Contacts” and “Other Contacts”, I don’t recall this before. Anyway, once I moved ALL my contacts from “Other” to “My” ALL the contacts showed up just fine. And this was synced thru iTunes and not Exchange, though they both work. I have managed to get my contacts from gmail using the itunes. However, I have found that when I connect my ipad to my mac computer somehow all of my groups lose their contacts on the computer. I end up with empty contact groups in my Address Book. Has this happened to anyone else and do you know what to do to fix it? By the way, the groups are ok in my Safari gmail. Frustrated!!!! Could this have something to do with icloud?? I will try the itunes option later. However, can anyone tell me how i get over the following issue when trying to do this through the exchange route. I add an exchange account, enter my google mail details, enter m.google.com in the server section and then it asks me for an exchange password. I dont have one, is there a standard password? I am new to apple and my ipad is purely for personal use. I just dont want to have to enter all my contacts manually!! Google is not an exchange account. It is a POP account. No Chris is correct. You can synch your ipad to google as an exchange account with the m.google.com. Thax for the post, it works great. Very helpfull indeed, got everything synced now. I followed all of the steps but I keep getting an error that reads: iTunes could not sync contacts to the iPad…becaue the sync server failed sync the iPad. Thanks for the information. This is the only place that said in order to sync Google Contacts with the Ipad, you had to do this through Itunes. Bizaarre, when you can sync mail and calendar through the Ipad. Once I had followed the steps in Itunes and then restared Itunes, It synced automatically. Thank you so much for the guided info, I have been trying for a week to get this done and almost gave up. I even went to the apple store and those idiots wanted me to take a class, they wouldn’t help. Thats not very nice, friend. Worked for me. Awesome trick. This was quick and easy – thanks for posting it! I followed the same but still unable to see gmail contacts in iPad. I can only see my office Exchange contacts.. I just did another way and it worked… Now I have two exchange accounts on my iPad and it shows contacts for both. No issue. Yes, actually my blackberry syncs amazingly, and the iPad can’t . This sway too bad. Hope they will come up with something soon. Thank you Davinder for taking the time to post this information. This iPad is an amazing device and I realize that it with this ‘hidden ability’ it continues to shine as the necessary median product, between Phone/PDA and Computer. In reply to Onexsculler, the reason it does not do this is because Google stores in contacts in a way that the iPad con not read so they have to be converted by iTunes. Thanks for sharing this. A ridiculously easy process for something the “genius” at the Apple support bar told me could not be done. Bizarre. Why doesn’t my iPad just automatically get all of my gmail contacts from the cloud as my phone and computer do? This is a useless device if it won’t do this all by itself instantly and automatically. I’ll take that useless device off your hands if you’re so unhappy with it. I probably wouldn’t call it useless, but I would strongly agree that having all my Gmail information except contacts seems very odd, and does degrade the email experience significantly. Apparently I can sync via iTunes, but that seems like a pretty clunky user experience, especially when every other mobile device I own synched my Gmail contacts seamlessly. You guys are all suffering from a bad product. Sure, it’s slick. But you bought into the cool factor and now you’re stuck with a useless product that can’t help you do things you want to do. Did you notice you all just jumped off the bridge?! BE CAREFUL. The iTunes sync with Gmail Contacts will not work to keep an exact sync over time. Contacts will duplicate, delete, and cause all kinds of problems. The reason is because both iPad/Mac contats and google contacts use different data points to identify unique contacts – for instance, the difference between using a name and an actual unique number. So when you change John Smith’s Phone number, it very well may change another John’s phone number, or even worse, begin to merge contacts. The only reasonable and reliable way is to use the MS Exchange Feature and create an actual account. I’m not sure I understand why setting up a Google account automatically configured wireless sync with gmail and Google Calendar, but does not provide iPad sync with Contacts. I’m new to the Apple world and appreciate help understanding why this was a challenge. Worked pretty seemlessly with my Droid phone. Your answer to dowload contacts from gmail to iPad worked. Thanks. 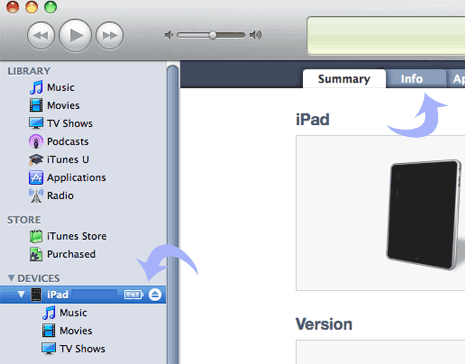 ipad does not want to import contacts from itunes – please assist!! Now I am having trouble figuring out how to transfer word documents from computer to ipad. I would appreciate any help with this. Thank you very much…it worked. Thanks for the instruction, very helpful. Although When I was done I ended up with two of every address on the iPad on almost all of my contacts. How do I fix this? Check the accounts section of your device. You probably have to different accounts sync with gmail. I had the same thing with the calendar, but when turned off the exchange account the duplicates went away. So, iTunes does it automatically?, or Google Sync must to be installed? This worked perfectly!!! THANKS! This is the PROPER way to sync contacts and calendar! Is this supposed to sync both ways? I have contacts on my Ipad that I want to transfer to google contacts but nothing happens. You have to make sure you create the contact on the iPad in the group view for the GMail account, and not the ALL CONTACTS view or the ON MY IPAD view. It is syncing only some of my contacts – I have 526 in gmail contacts and 31 in “my contacts” folder in Gmail contacts. Only 31 are syncing.